Please refer to our stock # NC-10 when inquiring. 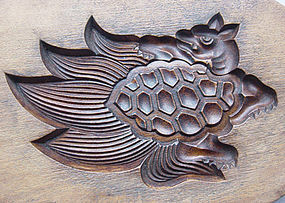 Kashigata (wooden sweet mold) with a dynamic image of a minogame (mino = "straw rain cape," kame/game = "turtle/tortoise.") Early 20th C., Japan. L.13"(33cm) x W.5"(12.5cm) x H.1.125"(2.75cm,) 1 piece paddle type mold. Some minor insect damage to back of mold (see enlargements 4 & 5.) The tortoise is a symbol of long life in Japan, and in Asia in general. In Japan, the image of a tortoise ("kame") of especially ripe old age shows seaweed growing on its shell, which resembles the farmer's straw rain cape, or "mino" in Japanese. The "minogame" symbol of long life could be used for any celebratory occasion. Together with the crane (tsuru), they form the two most common symbols of long life in Japanese traditional imagery; and the basis for the old saying, "Tsuru sen-nen, Kame man-nen (Crane - 1,000 years, Tortoise - 10,000 years.)" Sweet molds, “kashigata,” have been a part of confectionary culture around the world. Well-known examples in Asia come from Japan, China, Korea, and Indonesia. In Europe; countries such as Germany, Holland, and England have a rich history of cake mold production. Materials such as wood, ceramic, glass, plastic, and numerous metals such as iron, copper, and tin have been employed to shape cakes, cookies, and candy into objects of art and symbolism. In Japan, kashigata history goes back over 300 years, and wood has been the primary material since then. Commonly used woods include yamazakura (mountain cherry,) katsura (Japanese Judas,) ichou (ginko,) tsubaki (camellia,) and keyaki (zelkova.) Rarer examples may be made from kuri (chestnut,) kaki (persimmon,) and yanagi (willow.) An extremely wide variety of images was produced during the Edo (1600-1868) and the subsequent Meiji (1868-1912) Periods. Auspicious symbols such as cranes, tortoises, pine (evergreen,) and shrimp or lobster (with rounded backs like the elderly) symbolized long life; while others such as plum and bamboo represented the qualities of perseverance (plum is the first tree to blossom after the harsh winter) and resilience (after bamboo’s resilient nature against the elements.) The Sea Bream fish, “tai,” would have been used for any celebratory occasion due to the play on words “omedetai” (congratulations, felicitations.) Any of these could have been used for a wedding, birth, or New Year celebration. Other examples could be seasonal references; cherry blossoms in spring, chrysanthemums in winter, mushrooms in fall, peaches in summer (also symbolic of fertility.) In the late Meiji, Taisho (1912-1926,) and early Showa (1926-1989) periods; examples of Japanese imperialism also were portrayed in kashigata; including war slogans and military designs. In other cases, simple geometric patterns were utilized in kashigata. Throughout their history, Japanese kashigata have been produced in a tremendous range of imagery, symbolism, and design that has imbued the spirit of the carver and the mystery of natural and supernatural symbolism, into the artisanal tradition of handmade Japanese sweets.